I made Truffula Treats for our playgroup this week. 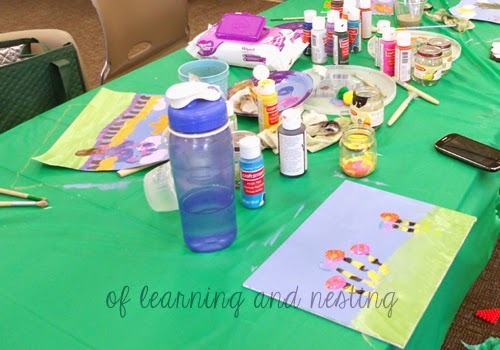 We get together every Wednesday to do a craft, and at the recommendation of a member of our Facebook group, the crafts fit into a monthly theme. This months theme was Dr. Seuss, and as we meet up around lunch time, I figured a snack would be a good idea. So I took to Pinterest. I found the absolute cutest treats. What I ended up going with I’ve been calling Truffula Treats. 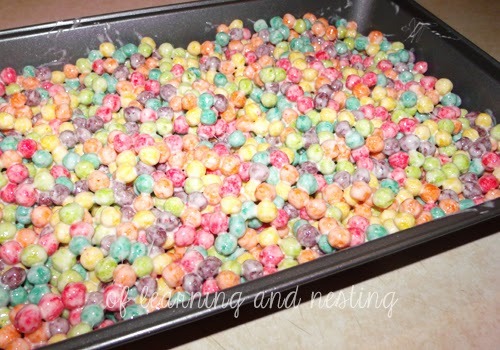 They are rice crispy treats made with Trix cereal. They matched the craft we were doing too – Truffula Trees using our kids hands! Colorful, Seussical, and yummy to boot. I followed the recipe here at Raining Hot Coupons. First, I put the margarine and marshmallows in my only Pyrex bowl. It looked pretty full, so I considered that maybe the bowl would be too small. However, knowing that the marshmallows would melt and take up less space, I decided to take a chance. 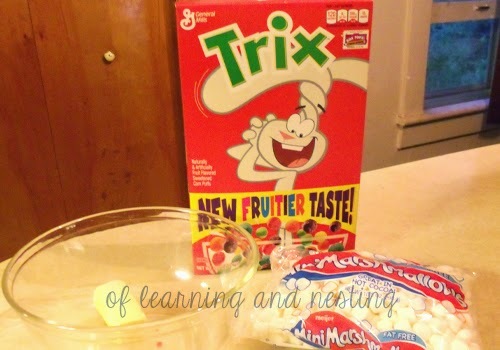 After heating, I started adding the Trix cereal. It’s a good thing I didn’t try to use the entire box because my bowl was too small. 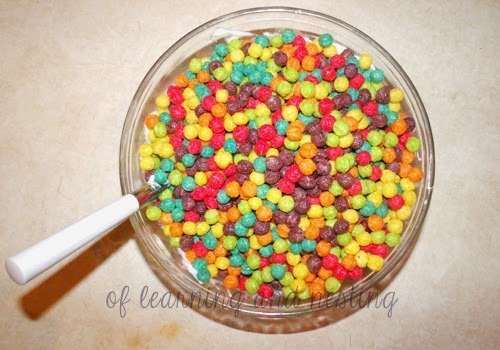 I did fit just around 7 cups of Trix in the bowl, but that was pushing it. Any time I tried to mix, a couple cereal bits would pop out of the bowl and try to roll away. I really liked that this recipe used the microwave instead of the stove top. It cut down on the time and mess. 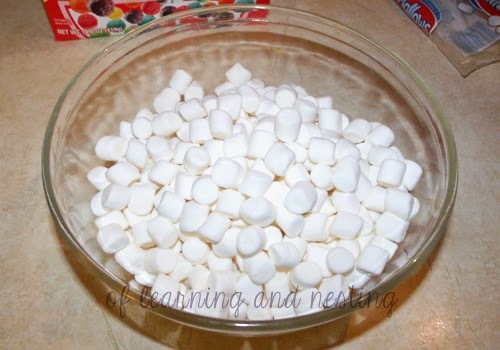 However, it limited my bowl choices, so I would have to dump the melted marshmallows into a larger bowl next time. You live, you learn. I bet these would make a great Halloween snack using one of the seasonal cereals too. Count Chocula for some Batty Bites, perhaps? Newborn Diapers – Do I really need them? Super fun!! We love the Dr and love love love Trix!! My son and I love making these treats together so he will just love this! !